Discussion in 'Off Topic' started by MrAlBobo, Oct 22, 2008. So...one of my friends made me take a look at this, alot of the edited comics are hilarious. lol that's a pretty neat concept, having a look at the rest on the site now ! lol, i read that all as one comic, then realised they were seperate ones when i checked out the site. Ruined the randomness of it, tbh. I never really got the humor in this. Any comic is going to become similarly amusing and random if you remove characters. It's nothing special to Garfield and so I find it rather meh. perhaps, but find and post another comic where this has been done to such a large scale? 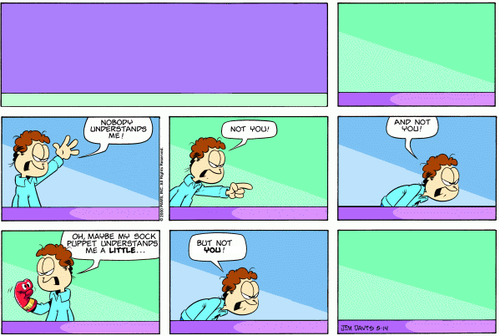 You don't find it funny that removing Garfield makes Jon look (more) like a weird lonely guy who talks to himself? I think this comic is hilarious, in comparison to the normal Garfield comics.